The All New, All Daring Delusional Honesty! : San Diego Comic-Con: Too Big To Move? As I sit in my apartment in the desert southwest, every once in a while loading something-or-other into my luggage for my forthcoming trip to the New York Comic-Con, recent headlines have grabbed my attention and made it necessary I address them. The San Diego Comic-Con International is staying in the town that birthed it through at least 2015. It's a frustrating decision, but at the same time, it unfortunately makes total sense given the relationship between Comic-Con International and the city of San Diego. 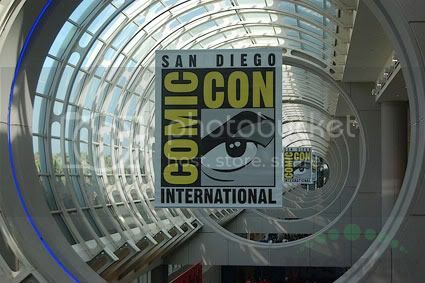 A bit of background: I have attended the San Diego Comic-Con International five times, with the first time in 1993 and most recently in 2007. I have seen the show grow from "just" the first major convention I had the pleasure of attending, to an event utterly unlike anything else I've found on this planet to date. The San Diego Convention Center has doubled in size over that time. I still have some sentimentality for the show, but it's been tempered over the last handful of years due to the explosion of popular non-comics media into the convention. And by explosion, do I ever mean the word! See? Here's what I mean by "explosion"! The growth that the San Diego Comic-Con International has undergone since the Convention Center completed its first expansion in 2001 has been nothing short of mind-boggling. While you can correlate the growth to the expansion itself, keep in mind what else has exploded in popular culture: super-heroes and comic books have become Hollywood's darlings. True, Blade (1998) and the first X-Men film (2000) predated the explosion, but you can argue that 2002's Spider-Man truly broke the barrier and sent comics into that stratospheric next realm. Since then, Hollywood's optioned virtually every worthwhile comic book for a movie or TV show, and even some that are pretty worthless. And Hollywood took another look at this comic book convention that never attracted much of their attention before, and found they could gain a foothold and promote their comic-related projects. And their sci-fi projects. And their horror projects. And some other movies and shows that don't have a damn thing to do with comics? We'll throw them in there, too, and hope nobody notices. Somewhere along the line, comics fell out of favor with Comic-Con, and the management of Comic-Con International decided they didn't really care so much. Sure, you'll find Marvel, DC, Image, and the other comic companies have a presence there, but they've been eclipsed by Warner Bros., New Line, Miramax, 20th Century Fox, Walt Disney, and various other movie studios. 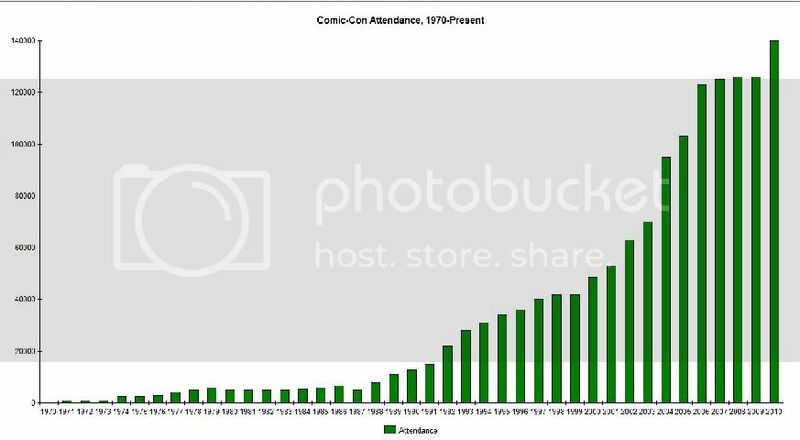 And yes, they draw the crowds and put the asses in the seats in the now-legendary Hall H. But is that really what Comic-Con is or should be about? Now, the door was ajar for years. I've heard many stories about how some film craftspeople would use Comic-Con for their own personal soapbox, but never in the scope as in recent years. The last decade's worth of comic book movies has proven the catalyst for the Hollywood takeover of San Diego Comic-Con. And Comic-Con International (the company who runs the convention) seems all too happy to let Hollywood take over. Revenues have never been so good! Demand increases, prices for booth space go up, and CCI makes money hand over fist to spend on non-profit type stuff. It all comes out great for everyone, doesn't it? I don't think it does. You see, there's also the flipside of the coin in so many ways. At first, the comics fans enjoy Hollywood as a presence because they're bringing to life their favorite heroes and related projects. Then you have the trickle of fans who come to Comic-Con because of the movies or TV they're seeing, and CCI maybe hoped that those fans would find something they enjoyed of what birthed those movies or TV shows. Only, that doesn't happen, or happens only rarely, and people continue to come for the popular media, the chance to touch Hollywood. The convention floor now reflects this loss of ground from a primarily comics-centered event to one mainly devoted to Hollywood in its totality, nearly to the exclusion of the elements that founded the event. The comics pavilions have become smaller and smaller as New Hollywoodland is now the fulcrum about which Comic-Con revolves. Booth prices continue to rise meteorically, making it increasingly difficult, especially in the current economic climate, for the very same kinds of comics retailers who began the show to have any kind of presence there. I've had discussions on Twitter about this phenomenon, and the pro-San Diego faction stated something along the lines of, "Smart comics retailers find ways to cut their budgets to attend the convention, even splitting and/or sharing their spaces." (And this is if the space isn't already taken up by the studios.) I found those comments to be truly abhorrent. It's like living in the same place year after year, but when they put in those nice new spacious condos for the top one-half of one percent and property values up, you have to either move out, or start taking on boarders and give up what was previously your own space to "enjoy" your "home"--if you can either call it enjoyable or home anymore. The dramatic increase in exposure for Comic-Con has translated to greater revenues for virtually all businesses in the area surrounding the Convention Center, including the various hotels at which the tens of thousands of visitors stay, plus the restaurants and other shops making up the Gaslamp Quarter and surrounding Downtown areas. The convention was estimated to bring in over $163 million in revenue to the city of San Diego in 2010. San Diego Mayor Jerry Sanders freely admitted in a cbs8.com article that "The convention center is a huge economic generator, but it could literally double that economic generation once we expand it," referring to the current plans to increase floor space by another 200,000 square feet in the next few years. Can you see where I'm going with this? If not, here's a bit more. Per the San Diego Convention Center's website, no other event held at the locale even comes close to the annual attendance of Comic-Con. The event that comes closest according to their 18-month schedule is the "Rock 'n' Roll Marathon Health & Fitness Expo," at about 40,000 people--still not even a third of the crowd Comic-Con attracts annually. And I think to myself, this is the same Convention Center that has committed to the aforementioned expansion? Why else do they need the expansion if not to keep Comic-Con? I might go so far as to suggest the city needs Comic-Con. With Hollywood largely driving it, and the huge revenues it currently provides only hinting at the even larger revenues that could be drawn from the upcoming Convention Center expansion, and the absolutely insane room rates that are part of that revenue stream, letting CCI take Comic-Con out of the city would be tantamount to dropping an economic bomb in Downtown San Diego. In different economic times, I'd really waffle on whether San Diego would let the convention go, but Comic-Con is that proven sure thing that the city can't do without. Simply put, San Diego Comic-Con has become akin to the big Wall Street banks you heard about the last two years. It's "Too big to move." And as in the banking world, I find this idea truly saddening, considering what the convention has become over the last decade. So, how do we undo the damage Hollywood has done to Comic-Con? Assuming, of course, that it can be undone--and I'm not convinced at all this is a genie you can put back in the bottle. I think two things can level the playing field a fair bit, if CCI were to seriously consider them. Sadly, I don't think they would, because the demographic for Comic-Con is shifting into that which really wouldn't like the same kind of show that it was before the floodgates opened. Anything that could potentially upset the goldmine the city of San Diego has going is too radical an idea to be considered. First, I think that the huge displays at Comic-Con, as extravagant as they are, must go. To maximize space and find room for as many retailers and craftspeople as can attend, there should be a limit as to the size of displays. Hollywood's booths are too huge, and they force out those who are just trying to get a corner booth, or some small space. Ten or more smaller booths can fit into just one of the larger studio booths! Bigger is not necessarily better (in fact, hardly ever! ), and studios and other companies can most assuredly find better, more inventive ways to use the space they are given. Second, I don't think it's enough to limit booth size. I think it's also worth apportioning space, which is done a bit with Artist's Alley (which is still too small!). It can be done gradually at first so it's barely noticed, but I think a nice balance can be struck between the different kinds of companies and individuals who attend Comic-Con. Imagine only so much space allocated to Hollywood's setups, so much given to comic companies, so much to small press, so much to Artist's Alley, so much to some specific kinds of vendors. I haven't heard of any such plan, and it would surprise me tremendously if it did exist. It would go a long way toward reversing the unfortunate trend of forcing those who don't have deep pockets (i.e. those who aren't major comic companies or movie studios) to the background or offsite entirely. There are other options I've heard, each with their ups and downs. I know the idea of making the convention a week-long affair has been floated as a cost-managing or cost-recouping measure, and would allow more people to visit the show on a daily basis, but it would involve radically altering how special guests and talent attend the convention. There is also talk about extricating the "comics" part of Comic-Con from the popular media part and setting them months apart, which is a slippery slope, a prospect that suggests that the two can't rightly coexist. Is Comic-Con as we knew it dead? It certainly is no longer the show Shel Dorf intended it to be when he organized the very first show in 1970, with Forrest J. Ackerman as its special guest, and a small handful of talent and attendees. It seems the show is stuck in San Diego, a town that will do just about whatever it has to do to keep it there and to keep or increase the extraordinary revenue stream it brings. It's gone mainstream, commercialist, "Hollywood," and the management seems locked into keeping it that way so long as they can shout CCI is a non-profit organization that proliferates the arts above everything else. To make changes--anything other than making the show bigger, making it "more"--would be admitting that somewhere in the intervening years, the show's purpose erred. I'll be anxious to see what the new round of renovations to the San Diego Convention Center brings. Will the smaller retailers be given a new entry into Comic-Con, or will Hollywood gobble up the space as soon as it's made available? Will a bit of the old Comic-Con find its way back, or will it be pushed aside, buried forever, presuming it hasn't already been? At any rate, it's going to be interesting to see what CCI does over the next few years.